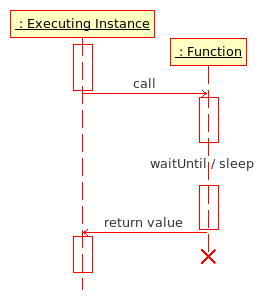 Functions are first loaded as [[String]] from a file via [[preprocessFile]] or [[loadFile]]. They are then executed via the [[call]] command. Since Armed Assault the loaded [[String]] needs to be [[compiled]] in order to convert it to [[Code]], which is requried for [[call]]. Functions are first loaded as [[String]] from a file via [[preprocessFile]] or [[loadFile]]. They are then executed via the [[call]] command. Since Armed Assault the loaded [[String]] needs to be [[compile|compiled]] in order to convert it to [[Code]], which is requried for [[call]].